What's the next step for the Muppets after their movies? Well, if all goes according to plan, they'll be returning to TV for a brand-new Muppet show. ABC is filming a proof of concept for bringing the puppet actors back to the small screen. 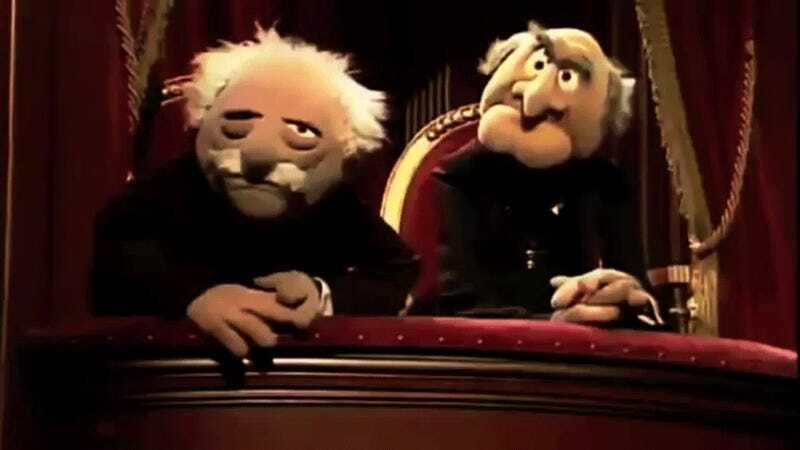 Statler and Waldorf already hate it. The Hollywood Reporter has the news that The Big Bang Theory co-creator Bill Prady will be co-writing a Muppets pilot production script with Bob Kushell, who is onboard as showrunner. Like the original Muppet Show, this new series is being pitches as a variety show featuring our favorite felt troupe. If the folks in charge like what they see, the show could get a straight-to-series order. Apparently, the pilot presentation involves Kermit and company trying to revive the Muppet Show. There's just one problem: They need Miss Piggy to sign on and things between her and Kermit are a bit rocky. THR notes that this won't be the first time Prady has written for the Muppets. Although Disney passed on an earlier idea he had for a Muppets TV show, Prady received an Emmy nomination for co-writing the 1990 TV special The Muppets Celebrate Jim Henson and has written material for Muppets-themed park attractions. It will be interesting to see what the tone of this new Muppet series is. Will this be a show aimed primarily at children, or will it have the original Muppet Show's delightful mix of content for all ages? Gif via Heidi (is) the Bee's Knees.